It has been well recognised that water resources management is based as much upon human decision making as it is on the availability of the resource itself. However, until the 1970s there was only a sparse social science literature that provided theoretically sound, but pragmatic, tools for water resource decision-makers and managers to incorporate in participative planning processes. Geoff Syme, in collaboration with many water agencies, systematically developed and applied social techniques which could be integrated with engineering and economic analyses to address the key questions facing the industry. Many of these techniques are now standard practice in the water industry and have been influential in facilitating community involvement in decision-making and public ownership of water problems. While it has been recognised for centuries that human civilisations have relied on water to develop and prosper, this has been increasingly difficult to do with increasing populations, greater urbanisation, problems with water quality and increasing problems of equity and fairness in situations where potential demand can outstrip supply. Until relatively recently in Australia’s history the availability of water has been assumed. If there wasn’t ample supply new sources could be developed and many a political career was enhanced by the commissioning of a new dam. All that has changed. Competition has emerged among irrigator communities, industries and urban and rural settlements. In addition, new voices have advocated the rights of the environment and there has been vocal opposition to new sources of supply. Thus water management has moved from development to maturity. Traditional engineering skills have needed to be supplemented by, and integrated with, careful social and economic analyses. Such analyses have needed to be blended so that the social and economic consequences of water allocation decisions could be readily understood. Water sharing and the role of the user and the general public in allocation decisions have become central issues in society. This thirty year research program by Geoff Syme and his colleagues in CSIRO has tackled these issues in a number of ways but notably on two fronts. Firstly, by merging perspectives of psychology and economics and secondly, by creating community based theory and methodology to promote transparent shared solutions through advances in the theory and application of equity and fairness. It is well known that the economy particularly as manifested by the stock market’s behaviour depends on the characteristics of human decision-making both as individuals and in groups. The same can be seen in day to day consumption at individual and household levels. Such insights are also important in resolving water management and related environmental planning problems. One example for Perth’s water supply is presented here. 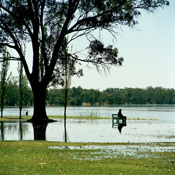 In the 1980s, the Perth Domestic Water Use Study had been conducted to establish, for the first time internationally, exactly when and where household water was consumed. Just over a thousand households were involved over a year. If supply planning and demand management were to be successful, the determinants of water use and the likely responsiveness to policy interventions, such as restrictions and price and tariff changes, needed to be understood. A socio-economic component was added to establish the household economics of water use and garden investment and the relationship of household attitudes to water using behaviours and water use. A key requirement of the socio-economic analysis was the estimation of the price elasticity of water consumption. That is; what would happen to consumption if the price was raised (or for that matter lowered)? This estimation is conventionally undertaken by analysis of longitudinal data series. In this case the data were not available because of a major change in pricing structure from that based on the rateable value of property to pay for use. To overcome this problem a family interview was conducted. Firstly, participants were given feedback on their previous consumption, reminded how much they had paid and the proportion of their water use for a variety of activities (garden, showers etc). The family were then invited to consider a variety of potential price rises and one price cut. Having examined the bill the household then discussed what, if anything, they would do in response to the price changes. The ensuing discussion was usually lively around the likelihood that certain actions would be consistently adopted (e.g. shorter showers, altered dishwasher operation). Once an agreement was reached as to what was feasible for the family to achieve, feedback was provided on the outcome for their possible expenditure. The family could consider given the inconvenience (or behavioural costs), whether the financial gains were worth it. The process continued until convergence was reached thus obtaining a merging between judgments of behavioural and price acceptability. (Incidentally, the price reduction did not alter desired usage). A low price elasticity was found using this method. This was eventually replicated by conventional price elasticity as the pay-for-use regime continued and more data points were available. The important contribution was that by merging behavioural and pricing judgements a valid prediction could be made for demand managers in a timely fashion. Most Water Acts have pronounced that water will be allocated equitably. But what do they really mean? The word is ubiquitous in discussions of water allocation. It is usually used as a justification of the speakers viewpoint. Geoff Syme and Blair Nancarrow decided to tackle this issue in the mid 1980s before the emotions that were beginning to surround water allocations in Australia led to conflict. The program began by assessing the usefulness of social psychological theories of equity developed for such issues as social welfare for water issues. It was discovered that such work could not explain the wide array of ethical or ‘fairness’ principles that the community generally regularly used when discussing water allocation. The researchers therefore adopted what they called a ‘lay philosophical’ approach whereby carefully listening to a wide variety of allocation conversations a number of ethical statements relating to equity and fairness (some 113 in all) were derived. A community based methodology was derived from these statements. It involved identifying that these philosophies were organised at two levels when people considered allocation problems-‘universal’ (what values should our country hold overall on these issues) and ‘situational’ (how these should be applied to particular allocation decisions). Groups of people could be identified by their differing responses to the universal questions in terms of their ideological stance (although there was substantial underlying agreement in this area). These groups could then be used to map potential solutions for specific situations to establish clearly which ‘ideologies’ were or were not included. Thus the underlying equity or fairness values in any particular solution became evident. At a local level principles were gathered for each interested group when discussing potential solutions. This was undertaken in informal interviews and discussion groups. The community’s allocation alternatives were then derived with reference to the equity or fairness principles. A survey was then constructed based on the discussions. It was completed by individuals at home. The survey collected information on the universal philosophies of fairness and equity and a rating acceptance of all specific suggestions made by the community to resolve the allocation problem. A sub set only of those suggestions or components can be included in the final solution as some are usually contradictory. A solution was derived by sequentially including the component of the solution which had the most support until such time as no significant numbers of new individuals could be included by adding another component to the solution. The fairness of the overall solution could then be assessed by examining the number of acceptable components which emerged for each ideological group as well as for other demographics such as age or in rural areas crop type. This methodology was applied successfully in four states of Australia with varying degrees of allocation conflict and provided a concrete ‘equity’ basis for all participants. Perhaps the most notable application of this methodology was in the Namoi valley in NSW where a four part solution was identified. Only twelve of approximately 270 respondents did not have one of their suggestions taken forward. Of those there was no significant or universal philosophical consistency. Therefore, the community had a starting point that could be demonstrated to be inclusive. Interestingly, the four components to the overall ‘solution’ included efficiency, reward for effort and equal opportunity components. All of these motivations have been shown to be important in experimental studies of computer based sharing studies. In this case the problem was defined by the community, the ethics and fairness components of it described and the components of the solution mapped by them. Given the severe potential loss of water allocation for many in the Namoi valley, it shows that while self interest will always be evident, equity and fairness will continue to have a place in community decision-making providing they have concrete means by which they can be included. Syme GJ, 2009, Personal communication.